The contest is open to the public and visitors are welcomed. Entry free. P R O G R A M 9. 4. 09:30  First qualifications for Linefollower, MicroMouse and MiniSumo. 10:00  Exhibition of the Freestyle robots. 14:05  Category Linefollower - final. 14:45  Category MicroMouse - final. 15:30  Category MiniSumo - final. Presentation of the stratospheric balloon project. If You cannot come, watch the Istrobot contest online! Important information about the accomodation. 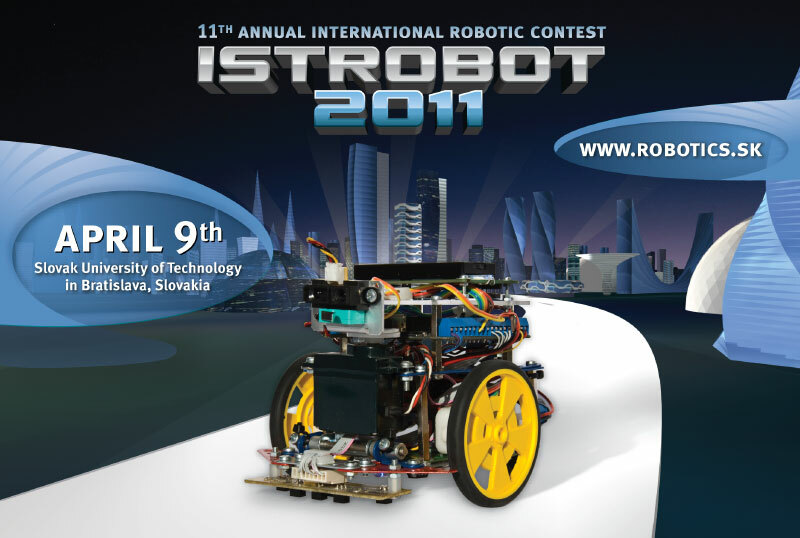 Registration for Istrobot 2011 is open. Deadline for registration is March, 28th 2011. Don't forget to register in time! The task is to construct an autonomous robot that will complete the racing track and negotiate all its pitfalls. The robot must track a black line on the white surface. It contains several obstacles - for example a bridge, tunnel to pass through and a brick to be avoided. The task is to construct a robot that can autonomously solve a maze and achieve the goal in the shortest time. When the robot tracks the right hand wall it will solve the maze, but not in the shortest possible time. The task is to build an autonomous mobile robot which is capable of pushing its opponent out of the ring. The first robot that touches the outside of the ring loses the round. The first robot to win two rounds, wins the match. Robots are weight and size limited. In this category, competitors are encouraged to demonstrate their robotics creations which do not fit into other categories. Each contestant has 5 minutes to demonstrate his or her robot's capabilities. The winner is appointed according to the strength of the audience applause and the jury judgment. And for each category also the common rules apply. They deals mainly with the safety issues and materials. Application deadline is March 28th, 2011. Download photos and press release..
Ilkovičova 3, 812 19 Bratislava, Slovakia, tel. +421 - 2 - 602 91 411.